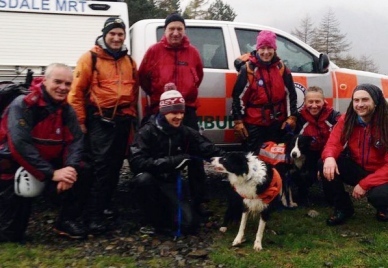 A border collie which was rescued from the sub-zero temperatures on a Lakeland fell has visited the team who brought him back to safety. Jasper and his grateful owner Adam Nolan have handed over a cheque for £63,000 to Wasdale Mountain Rescue Team who sent out a party to carry him down Broad Crag after he disappeared while walking with Mr Nolan at Scafell Pike five days earlier. To show his appreciation to the team, Mr Nolan, of Cleator Moor, set up a Justgiving page and the total raised so far is £51,612. The money will be used to help Wasdale Mountain Rescue Team fund its planned new rescue base. A further £11,582 in Gift Aid is to be used for equipment and training. Mr Nolan, of Cleator Moor this week attended the team’s Annual General Meeting in their Gosforth headquarters with Jasper to hand over the cheque. When Jasper went missing, Mr Nolan set up a Facebook page appealing for people to help find him. Thousands of people from across the globe followed the story but it was Carlisle man Geoff Horky, an experienced climber, who found the dog on November 6, before calling for assistance to bring him to safety. A Wasdale team spokesman said: “The Wasdale team responded to the 999 request and a party set out to locate them, treat Jasper’s injuries and carry him down the mountain in a makeshift rescue stretcher. “When back at the base, to show his thanks, Adam set up a Justgiving page and within minutes the donations to the team started pouring in with £1,500 given in the first 30 minutes.